Fryup Head (that is the upper or higher end of the dale, where it is newest and narrowest, where it has just begun to be scooped out from between its steep containing banks) is one of the most picturesque of all the picturesque dale-heads in the district. At the point at which the division of the dale called the “the head” begins (that is, as you ascend or go up the dale in a southerly direction) the width of the valley from moor edge to moor edge is fully a mile and a quarter. On the west side the upper bank is steep and rocky, and clothed with wood, mainly pines, extending nearly a mile in length. Where the wood ends the last rise or upper hundred feet of the bank becomes more rugged and precipitous, turning around abruptly about the third of a mile farther on, and taking an easterly direction instead of the original one towards the south. And soon after the turn the place or part of the “head” called “the hills” is come upon, and “the hills” in Fryup Head are a very singular feature indeed. Of course the authentic story of the Eildon Hills and the manner of their formation is in everybody’s recollection, as are also their general aspect and appearance. Remembering all this, one would be fully justified in assuming that some apprentice of the great manufacturer implicated there had been at work in the head and that his “‘prentice hand” had wanted a very great deal of “trying” indeed. For all along the last half of the rugged, broken, precipitous bank (as it has now become), spoken of as running towards the east, and yet onwards still, when it makes a turn and goes for the south, lie tumbled, in infinite and most confused confusion, a series of short banklets, hillocks, mounds, and peaks, with intertwining gullies, slacks, and hollows – these last with the lush growth of damp or watery places in them, and the banks with scattered rather than scanty growth of bracken, juniper, and whin all about them. Many a question has been asked of me by the people, craving an explanation of this wilderness of confused and tumbled piles of earth and rock. “Had there been mining, perhaps mining for iron, there, and on a large scale, in old times?” “Had there been an earthquake, and had it thrown ‘the hills’ up in that strange way?” “Had they been made and left by the Flood?” Such questions have been put forth once and again, and I remember wishing the querists could have been present one day as I was walking with an enthusiastic and much-travelled geologist over the lofty ridge of moorland commanding a full view of a great part of these “hills”. As he came suddenly and unexpectingly in sight of the strange waste of broken ground, down dropped his stick and up went both arms in his surprise and admiration, a rapid exclamation following, “Oh, what a lovely undercliff!” There was the explanation in one word – an undercliff – and opening up what a vista into the far past! 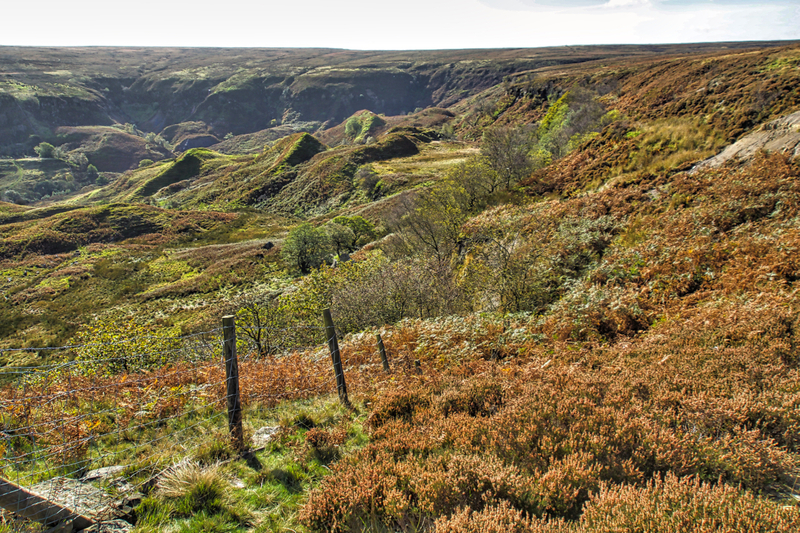 A great body of water filling up these depths that are now dales, in its milder moods gently laving the foot of the cliffs which now supply the moor-topped banks of the dale, and in its rougher tempers sapping their stability as surely as rudely. And then when the process had gone forward to the requisite extent, there ensured the falling forward of the upper and undermined portion – veins of rock and deeper solid beds, and thick strata on unconsolidated earth and stones – and the issue of the falls was “the hills”. I came down Fryup Head a few weeks ago and wondered the same. Now I know!